We were excited to see the final presentations of NWMEDIA 201, Questioning New Media, our foundational seminar on art, technology, and culture! Led by Jill Miller, with support from her GSI Renée Pastel, Questioning New Media this year dealt with the work of such artists as Vito Acconci, Julian Oliver, and Adrien Segal — and the students' critical responses were phenomenal! 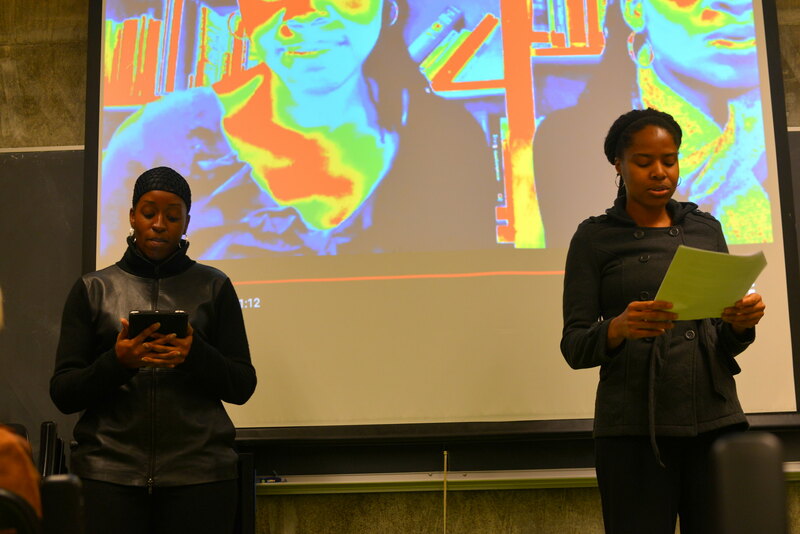 Lashon Daley & Grace Gipson presented "Say It Loud," an exploration of identity and blackness through music, poetry, interviews, and their own personal recollections, punctuated with visuals that highlighted these concerns. Ryan Ikeda & Will Payne began "Obfuscation" with a game that displayed how increased noise and information can support security and anonymization. They investigated what digital tools can aid this effort, and discussed reasons, such as repressive government regimes or corporate data mining, that can call for these tactics. Katie Johnson & Yaira Roman Madonado looked at "Mapping Narratives: From Public Health to Literary Studies," comparing how data visualization can impact our understanding of disease, human behaviors, as well as place and culture. Cecile Basnage & Leanna Leung began a "Mini Crypto Party" with bingo cards that employed terms from the Crypto Party handbook! They offered a few concrete examples of how we can make our internet use safer and more private. Stacey Baradit & Andrea Gagliano told a campfire tale (complete with digital campfire and real marshmallows!) of the constellations "Once Upon a Network Night," mythologizing and questioning our use the internet of things in daily life, through networked constellations determined by email use! Bélgica del Río & Kate Mattingly presented "The Work of Dance in the Age of Digital Reproducibility," discussing the potential role of the screen in key dance performances, including our very own Ursula Kwong-Brown's! KC Forcier & Ursula Kwong-Brown screened a video "Talk to Me" that dealt with online dating, labor issues, and corporate marketing tactics, through Liz, the paid voice of the "Talk to Me" Barbie, who first comforts the young owner of the doll and then speaks to the voice of a "Talk to Me" teddy. Congratulations NWMEDIA 201! Your work was exceptional!